What motivated me to create this Web site? My intent here is not to simply document the artwork which I have created, but rather to form a connection between the artist, the art itself, and you as the observer. Art is communication. It doesn’t need to be complicated, or even profound, but it needs to resonate in some way with the observer–to tickle some thought, memory, emotion, idea, sense or understanding. It needs to ask questions, as well as help us understand our relationship to the physical, sensual, emotional and spiritual world around us. Of course, there have to be pictures! 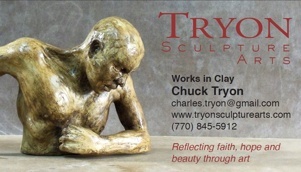 Sculpture is 3D, and intended to be seen from many different angles and with different lighting. My own sense of sculpture is very tactile — actually picking up a piece and feeling its heft and texture, turning it over in my hand. Trying to capture that in 2D, without distortion, or leaving out important details is tricky. Over time, I have developed some approaches to capture the feel of the piece, through effects like tweaking the lighting or using sharp angles and shadows. In this way, the photo conveys more of the heart of the piece, rather than simply recording its form, texture and color. What I enjoy about being online is the opportunity to tell the story behind the piece. Some stories are very simple, perhaps a phrase or thought which triggered the concept of the piece, or which the work itself may have triggered in my imagination after it was finished. Other stories are more complex and nuanced, either from my own experiences as I created the work, or from ideas and concepts which I am still working through. Some stories are silly, and intended to be that way — as an extension of imagination and play. I’ve never seen myself as the “tormented artist,” so I’ve never seen a reason to create dark or tortured art, but there are certainly pieces here which reflect the darker themes of our experience. We often talk about how art speaks to us, but how then does the work speak back to the artist? Something I have observed is the way the process of creation is, itself, a two way conversation between myself and the medium or piece as it begins to form. Sometimes, the conversation is… less than cooperative, as I wrestle with both the technical and composition difficulties of getting the medium to perform as I wish, to reflect the internal image I see. At times, it is a dialogue as I see concepts emerging which I may not have originally envisioned. The title of a work may even come to me as subtle details begin to come togeher. But the conversation doesn’t end there. The work speaks to those who observe it. Once a piece is finished, what I most look forward to is the continuing dialogue between you, as the observer, and the piece. I value your comments and feedback, more than you can imagine. As you tell me what you see, it feeds back into my own process, understanding what I am doing, and how the symbols and artifacts which I have incorporated work together to affect you. Please — leave me a note, a comment, or some other reaction. I will make my own best effort to respond back. I value what you have to say!